A diet that consists mostly of bacon, cheese, steak, and avocados sounds like a dream. A big, greasy dream filled with all the cheddar omelets and ribeye you could want. Deliciously fatty foods usually don't scream "healthy," but many people swear by these staples to lose weight. By eliminating all sugar and most carbs, and eating foods high in fat and protein, your body becomes a fat-burning machine, or so the theory goes. Win-win, right? Not quite. A big downside, other than missing sugar and everything in the bread family (RIP, bagels), is what these extremely low-carb diets do to your breath. By getting your energy from fat and protein rather than carbs, one of the common byproducts is intolerable stank breath, and it’s not because of the bacon grease. "I lost 114 pounds on this diet but I had BREATH like acetone," one Facebook user commented on a story about the ketogenic diet. "I've had truly repellent, revolting bad breath," Reddit user LisaJA posted. "My friends and family have rated it about a 7 or 8 [out of] 10. My teenager has to open the car windows, it's that bad!" The influx of ketones may be the biggest culprit of your nasty breath, but there are other factors at play, too. “The initial period of water loss in the body in the early stages of a low-carb diet can lead to dry mouth, another source of bad breath,” Dr. Wayne Aldredge, President of the American Academy of Periodontology, says. Is there a cure for my dragon breath? 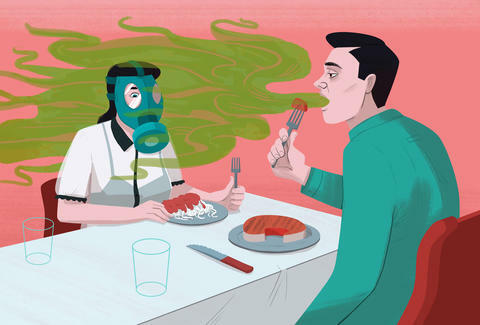 Your run-of-the-mill bad breath can be caused by a number of things, like not brushing or flossing enough, gum disease, or scarfing down a giant loaf of garlic bread. Those are all fairly treatable with some extra teeth brushing, minty gum, or actually flossing for once. The rotten-trash-heap breath you get with a low-carb diet, on the other hand, is a whole other beast that occurs when ketones are released, not because there's more bacteria than usual. In fact, forgoing sugar and starchy foods may actually be good for your oral health. Unfortunately, that also means ketosis breath can’t be extinguished with the typical handful of mints and swig of mouthwash. Some natural remedies may help, such as drinking extra water, or chewing on fresh mint leaves, cloves, or fennel seeds, Dr. Aldredge says. For a temporary fix, he also suggests reaching for sugar-free gum made with xylitol. The only real cure for keto breath might come from eating more carbohydrates -- Dr. Aldredge recommends reaching for more carb-heavy fruit and vegetables for a healthier option, but too much of those may throw your body back out of a state of ketosis. Obviously everyone’s experience on a ketogenic diet is different. If you’re one of the lucky few who's been able to remain a low-carb, fat-burning machine with perfectly fine breath, consider yourself #blessed and continue on your bacon-eating ways. But if you and your loved ones are really noticing a foul smell radiating from your mouth, you may find yourself facing a difficult choice. Losing weight on a no-carb diet is cool and all, but so is having a face-to-face conversation with a human without feeling self-conscious.